A little update for those returning to this page and seeing a different layout :) First off, I must say that I was very excited to get a mention in the GM High-Tech Performance magazine! It wasn't a full page centerfold of my car but they did mention this particular page with info on how to fix your headlight motor and that was still pretty cool! Yep, you read that right... finally, a metal gear replacement for your 4th Generation Firebird or Trans Am! This is a permanent solution to an ongoing 10 year problem with these headlights. Keep reading for details and ordering information! With the very high price of copper over the last year and the desire to keep my prices low for my customers, I started looking for an alternative to the rising costs of the brass gears. Around mid 2007 I ordered a very small (and expensive! LOL!) batch of prototype hard coated aluminum gears and had a handful of customers test them for me. Hard coated aluminum is already being used in many other similar applications but I wanted to test them just to make sure. Testing went fine and thus my most recent batch for all customers is a hard coated aluminum gear. Heck, when I first started researching this and had my first batch made many years ago I actually wanted to do a coated aluminum gear but copper was very cheap then and the brass was a better value. Well, at least for now, things have been switched around in that copper prices have gone up and the coating process expenses have come down and in order to keep my prices as they have been for the last couple years, I have switched to the hard coated aluminum gears. This hard coated aluminum gear is made exactly the same as the brass gear (still a beautiful CNC'd piece!) with an extra process at the end of hard coating. Brass by itself is stronger and harder than aluminum but with the hard coating process done to the aluminum gear, the aluminum gear exterior layer is actually now much harder than the brass. I had many discussions with the owner of the CNC company I deal with and we decided to go with the hard coated aluminum gear. I do not view the hard coated aluminum gear as being better or worse than a brass gear... in either case you are looking at a permanent fix so might as well go with the least expensive solution! Because of the popularity of the brass gear I do not want to completely delete all references to the brass gear off this page (until search engines and customers catch on to the hard coated aluminum!) so will keep the references to the brass. This is a CNC (Computer Numerically Controlled) machined gear made out of bar stock BRASS (now bar stock aluminum)! It is machined on CNC machines to exacting specs and detail. It doesn't get much better than this! Click these for a high resolution picture! I'd also like to add that I'm not selling these gears to make a huge profit and try to retire :) I decided to do this because my web site is costing me a bit of money to keep up (this is just a small portion of my site and the bandwidth I use is incredible which = $$$ :-) ) and I tried the "advertising" thing with banner ads and it just didn't work... hard to get people to pay for something they have been getting from me for free for years! LOL! And also, for the Pontiac guys who have done the fix described here a couple times, it gets to a point where the free fix just doesn't work anymore. Like I said, I'm not doing this trying to make a killing and to prove that I'm going to keep my FREE fix up below for you to try out first. Chances are very good the free fix described below will work for you. However, there is a chance that, once you do the fix, the ratcheting noise will be made in the other direction! Or, the fix may last a few months for you then the nylon gear will again fail. A Trans Am owner wrote me an email recently saying he felt as though he was on "borrowed time" by doing the fix. And, he is basically correct as the free fix described below doesn't "fix" the poor design problem... it just uses a new part of the gear which will likely fail just like it originally did... might last a month, 6 months, a year, who knows? Heck, even if the below FREE fix works for you, it wouldn't hurt to purchase one or two of these gears... you'll be giving yourself insurance for if they ever do go out and you'll also be helping to keep the Appearance Mod Guide and Fix-It Guide sites up and running! :-) Also, it is important to note that I only bought so many of these and once they are gone there is no guarantee I can have them made for the same price again. The machine shop can't guarantee they can give me the same price in the future. Plus, I ordered a lot of these and that brought the cost down considerably. I most likely will not order as many next time which means the price will go up once my initial batch is gone. I'll order enough so the price will still be reasonable but if you'll be keeping your 4th Gen Firebird/Trans Am for a while you might want to consider ordering one or two anyway in case you need them later because later they might cost more money. I don't want to have to raise the price but if the machine shop raises my cost on the gear $10, I'll have to raise the price $10 as well. Click a menu item to go right to that section or please feel free to read on through the entire page! Headlight Fix for the 3rd Gen! These gears are for the 1993 to 2002 Firebird / Trans Am headlight motors! These gears will also work for C5 (97-04) generation Corvettes! These are being sold in a "kit". Included in the kit is one CNC brass gear (now hard coated aluminum gear), one package of epoxy, and one Popsicle stick. This will do ONE headlight. I'm providing this option for those who have one bad headlight and only want to spend the money necessary to fix the bad one. One kit is $40 plus $5 for shipping and handling for a total of $45. Two kits are $80 plus $5 for shipping and handling for a total of $85. And, to avoid any confusion in case you want to order something other than one or two kits, I'll still only charge $5 for shipping. So, add up the number of gears at $40 each then add $5 for shipping. If you have any questions, email me. I'll accept two forms of payment. A money order or a PayPal payment. Please include any important info you think I may need on the PayPal form! When you send the money order, please send me an email indicating how many kits you would like and your mailing address so I can have everything ready for you when the money order arrives. Also, please include, with your money order, your email address and mailing address. Please use the below link to notify me of your intent to send a money order... the subject line will automatically fill and I'll be better able to keep track of things and your order. Thanks! Email Brent Franker indicating Money Order has been or is being sent! Please use the above link only if you want to purchase one or more of these gears. If you have questions and are not ready to purchase, please just email me at my regular email address bfranker@tampabay.rr.com. Thanks! Common Headlight Gear Failures - MUST READ! Below you will find all common 4th gen headlight failures/problems I have seen in the years I've been dealing with these headlight motors. Please read the below carefully and if you have a Firebird or Trans Am, bookmark this page because it is not IF but WHEN you will see one or more of the below :) There is a lot of reading but well worth it if you have a 1993 to 2002 Firebird or Trans Am! everything else is not :) Take a look below for extensive details about the gear failure that causes the motor to continue to run for about 5 seconds and make a terrible grinding noise. Description of how the motor worm gear torques away from the nylon or brass or hard coated aluminum gear and causes the gear to strip. motor assembly back into the car to prevent future problems! 3) The headlights cycle open and closed when they shouldn't. For example, when arming or disarming the alarm or just turning on the fog lights or parking lights, the headlights will cycle or go up but not on. This is actually 100% related to the stripped gear. In every case where I have heard of people complaining about the lights cycling or coming up when they shouldn't, they also have the problem of the stripped gear as mentioned above. The good news for you is that once you fix the stripped gear problem either by the temporary free fix mentioned below or by getting one of my brass gears (now hard coated aluminum gears), this problem will magically disappear as well :) What happens I believe is the stripped gear kinda "freaks out" the headlight control module so to speak. The control module doesn't know if it is coming or going so the lights do strange things. Fix the gear and the lights will go back to working normally for you again. 4) The headlight just won't go up at all and it seems like the motor is shot. This could actually be a couple of things. The easiest thing and is actually quite common is that the headlight motor connector gets very corroded. There ends up being so much corrosion in there that 12v can no longer make it through the corrosion to the headlight motor and it just quits working. Unplug the connector near the headlight motor and check the connections. Normally it will be very easy for you to see this corrosion as the connector may even appear burned or slightly melted due to the heat caused by the high resistance just prior to it completely not working. This is an easy check and is free so look at this first if your light doesn't move at all. 5) The headlight won't go up or once up, the headlight will not lower. If it is not the corroded connector like mentioned above then it could be the light is getting jammed in place. This can happen with either the nylon or brass or hard coated aluminum gears. I'm not 100% certain what causes it but it does seem to be related to some moving part in the headlight assembly wearing. Believe it or not, I don't actually have a Firebird anymore so can't study this and figure out exactly why :) It does seem to happen primarily on older Firebirds or ones where the lights get a lot of use so I do believe it is caused by something wearing which causes the light to get jammed in place. A lot of people will just raise the hood, spin the manual raise/lower knob a couple times, and then the light will go up/down. This fixes the problem but only for that one cycle and that is no good. The good news though is that I can explain a fix to ya that seems to work most of the time. What you can do to help prevent the light from getting jammed is to STOP it a little early. This will help to prevent the light from getting jammed. You can do this by making the stops which the raise/lower arm make contact with a little larger. Since they are molded into the plastic front headlight frame, just putting a larger one on isn't an option. But, what you can do is something fairly simple. It might require a little trial and error but the fix will be easy and cheap. What you need to do is put some THICK and fairly firm rubber tubing/hose over the stop. The tubing/hose has to have an inside diameter such that it will fit snugly on the existing stop or it will fall off :) What this will do is make the raise/lower arm make contact SOONER which means that the light will not go up (or down) quite as far and thus, hopefully, prevent it from getting jammed in place. If you try this and find that it didn't work for you, it is possible your tubing/hose is too soft or not thick enough. If too soft, get a harder hose :) If not thick enough you can either replace it with a thicker piece of tubing/hose or you can add ANOTHER piece of tubing/hose over the existing one to make it thicker which will stop the light even sooner. I don't know what size is best for this. There are so many brands and sizes out there that it would be impossible for me to list what works. What you can do though is take a look down in there and locate these stops. Use a pencil or bolt or whatever you have that is about the same size. You can then go to Home Depot or a hardware store and go to the tubing/hose section and get a few pieces like 6" or 1' long or however short they'll allow you to purchase. You should be able to get several sizes and hunks to experiment with for just a buck or two and have more than enough to do both your lights. 5a) On a side note and kinda related to problem 5 above is that you may find that you experienced the light getting jammed. Knowing that these lights have a raise/lower knob associated with them, you used the raise/lower knob to get the light started and then cycled them electrically and they worked. However, right after you did this when the light went down, you heard the terrible noise of a stripped gear. Bummer. What I believe happens and I've heard of it a couple of times is that what happened is some teeth on the nylon gear actually BROKE and that is what caused the light to jam in place. Then, after the next cycle of the light the stripped gear with the broken teeth became obvious by the grinding noise. 12 volts DC!) to the headlight motors. These are pretty resilient little suckers because I've only had like a couple people tell me theirs failed. Good thing too because they are not cheap. Junk yards sometimes get $50 to $75 for them. If you have tried all the above and just can't figure out why one of your lights is not working, it might be the control module but it is highly unlikely. If you have taken your car to a dealer it is likely they rattled off the top of their head that you need a control module and that "should" fix all your problems. Well, in this area, they are clueless :-) The headlight control modules on these cars hardly ever go out so definitely do not plunk down a couple hundred bucks first thing just because the dealer says so. The dealer will often tell you to replace this module when the lights go down and then immediately back up as I described in 6) above. This is a big money maker for them as well because the parts department at least marks it up double what it costs them (usually) and then they charge you big $$$ to change it when it really takes about 3 minutes for the average backyard mechanic to swap one of these out. So, be warned, while the control module might be your problem, I say it is very unlikely and something else is causing your headlight motors to not work properly. I asked my buddy, Kelly Drown, if he could assist me in taking a few pictures of the 98-02 style headlight motors for my page. Well, Kelly went WAY overboard as usual and actually made an installation VIDEO for installing this CNC brass gear in the 98-02 Firebird / Trans Am! Since the hard coated aluminum gear is the same, it is the same concept for ya :) The video is 17mb in size and about 10 minutes long. The video is awesome :) Check it out! The installation is very similar to that of the 93-97 with only minor differences... mainly in the location of the headlight motor itself and the electrical connection. Below are two pictures showing these differences. By watching the video and glancing through the pictures below for the 93-97 install, even an extreme novice will be more than adequately prepared to install this gear. Again, many thanks to Kelly Drown for taking the time to do this for me! And, if you haven't checked out Kelly's own site, you really should! Just click the graphic below. Kelly's site has a ton of information along with a great message board. Thanks again Kelly! Or, click here for a pdf version created by Brian Kinney. Thanks, Brian! This guide will be extremely detailed. I'm making it like this so even people who think they aren't capable of working on their car, will, in fact, be capable of doing this. Many of you could probably do this with no guide at all. Some could read through it and go out to do it. Others will refer to the guide step by step. Enjoy! Pictures are still of my previous brass gears but the concept remains the same as the hard coated aluminum gears are made to the exact same specs! Note: Each picture will be a clickable picture to a larger picture if you need to see more details. 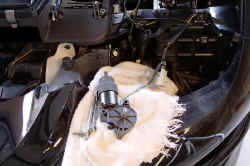 This guide will detail the installation of the gear on the driver side headlight of a 1995 Trans Am. The other side is essentially the same with only minor difference. NOTE: I've been told that on the 96 and 97 Ram Air cars the motors are oriented slightly different. Everything will still work out fine for you... the pictures may just be a little different. Locate the headlight motor next to the headlight. Your car may or may not still have the cover which goes over manual raise/lower knob. Remove the cover to expose the knob. Using the knob, raise the headlight to the full up position. There are 4 screws which hold a trim piece on around the headlight. I highly recommend removing this trim piece as it makes it much easier to get your hand down in there later on. Remove these screws and pull the trim piece straight out. You may need to slightly lift up on the headlight or push down on the nose of the car to get enough clearance to pull this trim piece off. With this trim piece removed, you'll have a slight gap between the headlight and the front nose. You can roll up an old terry cloth towel and place it between the light and the nose. This will keep the light up at all times even when you remove the raise/lower arm in the next few steps. 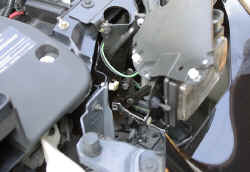 Disconnect the electrical connector for the the headlight motor. Remove the headlight motor shaft nut. These nuts are often times rusted or stuck on there pretty good. If it doesn't want to loosen very easily, I recommend using something like Liquid Wrench to help out. Once you have the nut removed, you will most likely need to spray Liquid Wrench (or similar) on the shaft where the raise/lower arm is attached. This is almost always stuck on there and even heavy prying doesn't remove it without the use of some type of lubricant. Leave the raise/lower arm attached to the motor shaft for now because it'll keep the headlight up for you while you get at the rest of the bolt heads. There are now only three more nuts which need to be removed to pull out the motor. These are 10mm in size. I recommend using both a ratchet and a wrench because these are a bit difficult to get to. Be careful not to drop the nuts... they always seem to fall into an area that you can't get to! Once the nuts are removed, pull the bolts out as well. Pull the raise/lower arm off of the motor shaft. You'll probably need to use a flat screw driver or some type of pry bar to do this. Just work it back and forth a bit and it'll come off. Don't force it... use more Liquid Wrench if necessary :) It is mounted to "plastic" and this can break! Keep in mind the raise/lower arm is the only thing keeping the headlight in the up position so when you pull this off, the headlight will fall! This headlight motor assembly is not made to be serviceable and the cover is glued/snapped on from the factory. You have to pry this cover off. Shown here are the areas where you'll have to pry from. I found it to be easiest to start prying at this location. You can get the most "grip" here :) Once you start it you'll hear it "snapping" loose. Note: I received an email from somebody I sold these gears to me and they told me they used a chisel to do the prying and it worked pretty good. So, that's another option for you! It's easier if you use two screwdrivers... one to hold the cover up slightly and the other to finish popping the cover off. With the cover removed you can see the factory nylon gear. Pull the metal shaft out and lay it aside for now. Here is just another picture showing a left and right motor. Again, you can see everything is the same with the exception of the metal shaft. Pull the nylon gear out and lay it to the side. With the nylon gear removed you'll see some left over factory grease. It is probably old and kinda spongy and dried up a bit. It'll be a good idea to re-grease the gears especially since we'll be doing metal on metal instead of metal on plastic! Any decent waterproof type grease like show will work. Graphite grease is the best and recommended. You can find this grease at your local auto parts store for about $2 to $4 a tub so it's not expensive. I wanted to include this grease with the "kit" but I couldn't find any place that sold little grease condiments :-) Plus, it isn't that expensive and many people have this stuff laying around anyway. With the grease in there, drop in the pretty new brass gear (now hard coated aluminum gear)! As you can see here, I just put a bunch of grease in the area where the two gears make contact. If you want, you can even put the grease on the teeth of the metal gear all the way around it (even though only half of it was being used) just to make certain you've got plenty of grease in there. You are now ready to insert metal shaft back into the gear. Depending on a number of factors, the shaft may or may not just slide right on. These gears were made using very tight tolerances... there is very little free play in any of this. So, if your metal shaft has a little rust on the end of it or is marred up for some reason, it may not want to slide through the brass gear (now hard coated aluminum gear) very easily. If you find this to be the case, you can use some fine sandpaper (like 600 or even 1500) or Emory cloth to smooth the shaft back out. You may also find the tabs don't want to go completely into the brass gear (now hard coated aluminum gear). If you experience this, there is nothing wrong with the gear... your tabs may be slightly bent or a little off. The gear definitely isn't "off" so it must be the tabs. LOL! If it doesn't happen to fit right in, pull it back out a little, rotate the shaft 1/4 turn and try pushing the tabs back into a different set slots in the brass gear (now hard coated aluminum gear). There are four different ways for the shaft to fit in and chance are one way will work. If for some odd reason you can't get it to fit good look at it closely and see which tab on the shaft is the problem and bend it in the proper direction. I doubt seriously you'll even have to mess with bending the tabs but I'm mentioning it just in case. You'll know you have it fitting correctly when the shaft assembly is sitting flush on the brass gear (now hard coated aluminum gear). You're now ready to put the cover back on! Test fit the cover back onto the motor housing to make sure sure everything fits good and aligns properly. Grab the epoxy and Popsicle stick I sent. use the Popsicle stick and push the epoxy away from one end of the packet. This will allow you to cut the end off the packet without wasting any epoxy. IMPORTANT: You are also going to want to use some sandpaper on the mating surfaces of the plastic cover and headlight motor assembly. Once you get it roughed up a bit (makes the epoxy hold better if it isn't perfectly smooth!) you'll want to clean the surfaces with rubbing alcohol. The epoxy will not stick to the surface if you got some grease on there from the step above! This is important so make sure you do this right! NEW starting 3-1-06: I am now shipping the kits with a different type epoxy. I've had a handful of people indicate the epoxy didn't hold for them. I contacted the manufacturer and they recommended I try one of their other brands. It is the same idea (packet like in the picture) but it is NOT a quick set epoxy! This epoxy must cure for at least 24 hours prior to re-installing the motor. It cures fully in a few days but should be good after 24 hours. Having said that, if possible, don't operate the lights for a few days after installing the motor just to be sure :) This I hope will fix the few cases I've had where the epoxy didn't work very well. To be ultra safe, you can still do what is mentioned below and put screws in there as that definitely doesn't hurt! NOTE: I've had a few people tell me no matter what they did they could not get the epoxy to stick and after checking the cover after a few days the cover would be loose. Here is an email from a customer. While this doesn't happen often, here is a recommendation if you are having problems with the cover staying in place. I just wanted to let you know that I solved my "epoxy won't hold" problem for our '97 firebird. In a previous email I mentioned how we were having a hard time keeping the cover on. It would work for about 4 months and then come apart. We tried 3 different types of epoxy in addition to what came with the kit, used sandpaper to "rough up" the edges, etc. Nothing worked. This last time I had an idea. In addition to using the epoxy, I drilled four very small holes around the outside rim of the cover/case. I then used these holes for installing four small screws slightly bigger in size to those used in glasses. I was very carefull to keep them to the outside so as to not interfere with the gears. This worked great! The cover has remained securely fastened without the slightest hint of coming apart. This epoxy packet has two separate compartments. One compartment holds the resin and the other the hardener. This is NOT a quick set epoxy (I'm sending a different epoxy than what is pictured here which indicates it is extra fast setting). However, you still don't want to mess around once you mix the resin and hardner together. Make sure you are ready to go and can get through with applying the epoxy to the cover and motor fairly quickly. There is no need to rush but you don't want to go in and eat lunch then come back! Cut the end off and squeeze the resin and hardener onto a piece of cardboard. Note: I didn't follow the directions to well. :) After I took this picture I read the back of the package. You can fold the epoxy packet then cut it and it'll squeeze the resin and hardner out together. Use your Popsicle stick and mix the resin and hardener together. Mix it up good! If you mess this up and get delayed, you can get epoxy at Wal-Mart for a few bucks. If you do delay a long time and it does setup on you, don't use it! It won't have good enough bonding properties to keep the cover in place. Use the Popsicle stick and liberally spread the epoxy on the edge of the entire cover. Try to cover the edge completely as this will help to prevent water from entering. Spread it on there liberally but be sure to not put so much towards the INSIDE that once you press the cover on the epoxy will ooze onto the brass gear (now hard coated aluminum gear) and glue your gear in place! Keep the extra towards the outer edge :) Once you get the epoxy on the entire lip, push the cover back in place (you already test fit it so you know it works!) and make sure it kinda snaps down. Hold the cover tight onto the housing for a few minutes to ensure it stays tight. If you have a couple clamps (c-clamps or even the heavy duty spring loaded clamps) it is extremely desireable to clamp the cover down and let it set there for AT LEAST a 8 hours. If possible, let it set overnight and reinstall the motor(s) the next day. If you need to drive your car, just make sure you won't be needing your headlights! :) Letting this epoxy setup properly is an important step to ensure the cover stays in place. Please don't stick it together then 20 minutes later put it back in your car and try it out because you are excited and want to see your headlights work again! :) Not allowing the epoxy time to cure (24 hours!) could mean you'll be taking these out again and doing this over and at worst, stripping the brass gear (now hard coated aluminum gear) because the cover came off! Note: Two people have emailed me saying they had problems getting the cover to stay after a few uses. I think this is due to not using enough epoxy and/or not letting it setup long enough. Don't skimp on the epoxy! Really pile it on there thick... thicker than it appears in this picture even. Too much won't hurt and if it "oozes" out the side then just spread it around a little to make it seal even better. If the cover does come off during use what can happen is the shaft can back out a little and the gear may not align properly with the worm drive and you'll experience uneven or premature wear on your brass gear! I recommend checking to make sure the cover is still intact a couple days after you finish the install. Then, check again after a week or two. You don't want this cover to come off during use! Some people have also told me, just as added insurance, they installed washers when they put the bolts back in. These washers were just large enough that part of the washer went onto the cover and thus when the headlight motor assembly is installed back in the car and the bolts tightened (now with the washers) the covers are wedged in there with the washers. Pretty good idea! Ahh... two FIXED headlight motors! Try to let the epoxy set/dry for at least 8 hours before re-installing the motors. And, if possible, after re-installing them let it set overnight before operating them especially if you only waited 8 hours before installing them rather than letting them set and cure overnight. We just need to make sure the epoxy sets up good before you operate the headlights. See above again for more reasons why this is a good idea! THIS IS VERY IMPORTANT... (See #2 under common problems above for additional info!) Now is also a good time to check and ensure the metal housing around the motor itself is fastened securely to the plastic gear housing. If it wobbles back and forth it can cause problems and wear on the brass gear (now hard coated aluminum gear) because the worm drive doesn't fully make up with the gear. To prevent this, ensure the metal motor housing is TIGHT and doesn't wobble back and forth. If it does, try to bend the metal tabs over more to make the metal motor housing tight and snug. (see top of page for detailed fix for this!) If you don't fix this and yours wobbles, there is a chance you will also strip your new metal gear! This is also something that can happen over time so if you do the repair and all looks good, it isn't a bad idea to check this every so often like when changing the oil, every 6 months or so, etc. Just keep an eye on it because if these tabs come loose, it is only a matter of time before you start having problems again! Once you get everything back together, use the raise/lower knob to manually lower the headlight back down. DO NOT FORCE IT DOWN WITH THE KNOB! If the headlight won't go down flush, check for an obstruction... maybe your trim piece isn't on right or something like that. In fact, I recommend that when the headlight starts getting close to being down and you feel some resistance, stop. The first time you turn on your lights, they may not go up. This is normal. Turn the lights back off then back on again. Using the raise/lower knob can sometimes freak out the headlight module. Turning the lights off and on again will reset the module. Also, I shouldn't even need to mention this but will anyway... this gear comes with ZERO warranty. It is a metal gear with no moving parts so the likelihood if it breaking is slim to none barring the front of your car being hit by a freight train and that's rather unlikely :) Use this gear at your own risk. It's metal and if you drop it on your foot it might hurt, ok? LOL! Also, please don't come to me after a month, a year, whatever and ask me to buy you a new part for your car blaming the failure on this metal gear. If you are worried about something like that please don't buy one. Keep in mind, it is nothing more than a duplicate of the nylon gear only made out of a stronger material. I've tested it and it works great... if you want a laboratory test proving it is going to last like 10 years... well, I don't have that :) Like I mentioned above, I'm doing this for you Pontiac guys as an alternative to spending $200 or more on a new headlight motor which would most likely fail on you again later down the road. This is pretty much just a copy and paste of my previous page and what I have had here for several years. Good luck and enjoy! 3. Now that the trim piece has been removed, access to the headlight motor shaft "end nut" will be easier. The next step is to remove the motor shaft nut so that the headlight raise/lower "arm" can be pulled away from the motor shaft. For now, only remove the nut. 4. With the nut removed, pull the raise/lower arm off the motor shaft. You may need to use something like "Liquid Wrench" and let it soak for a few minutes because the raise/lower arm sometimes rusts to the shaft. Note: This will be easier if you have somebody to help you hold the headlight up because it will not stay up by itself once this arm is pulled off the shaft :) You'll notice that the shaft is not perfectly round. It has two flat spots. You need to look at how these flat spots on the shaft are situated... one of the flat areas should be approx. facing the front of the car and the other towards the rear. Reattach the motor shaft nut and manually lower the headlight with the manual raise/lower knob... do NOT go too far! Stop lowering once the headlight gets about flush with the hood. It will automatically align itself properly once it has been electrically raised then lowered. Put everything back together and you should now have a quiet headlight! The following pictures just show in closer detail the headlight motor assembly. This picture shows in better detail the motor shaft. This picture shows an internal shot of both the actual metal motor worm gear and the plastic gear that often fails. As you can see by the picture, you "could" take everything apart, lift up the plastic gear, rotate it 180 degrees, then reinsert the plastic gear to fix the problem. BUT, I do believe the above method is just a little bit easier :) If, for some reason the above method failed, you could remove the cover on the gear housing and try to manually position the plastic gear so only "good teeth" are being used. Often times if the quick fix didn't work for you, you'll hear the ratcheting noise when the light goes UP instead of down! If this is the case your gear is worn too much for the quick fix and you'll need to disassemble the motor as shown to the left. Rotating the gear 180 degrees didn't work for you so what you'll need to do when you disassemble the motor is rotate the gear 90 degrees by picking up the gear out of the housing and rotating it 90 degrees. Use the picture at the left for a guide as to where the good teeth need to be but keep in mind you will need to align the shaft to reinstall the headlight arm... this could mess up your "good teeth" alignment if you don't pay attention to the metal shaft when reinstalling it back in the plastic gear. Use epoxy to reattach the cover. Yeah, this would be a bit of work but as a last ditch effort, it's worth a shot! In this picture if you look closely you can see where a portion of the plastic gear teeth are actually worn away in the center. This is what causes the "ratcheting" and vibrating effect when the headlight reaches the closed position and in some cases, the fully raised position. What happens is the motor continues to turn (even though the plastic gear is not) and therefore the sensing circuit still "thinks" the headlight is moving in the up or down direction. The bad news for you 3rd generation Firebird guys (1982-1992) is that I won't be offering metal gears for you guys. Now, the good news is that 99.9% of the problems associated with headlight problems for you guys is NOT related to the nylon gear failure! You guys are fortunate in that your problem can likely be fixed with less than a buck's worth of supplies from a common place such as Home Depot or any hardware store. So, if you're a 3rd gen guy and found this page looking for a gear replacement, I'll bet you a 6 pack you most likely don't need one. Instead, take out your headlight motor and open it up. If you see a bunch of dust and granules in there you will probably also find your gear to be just fine and all you need to do is perform the fix I mention above. Good luck and consider yourself lucky you don't have the expense the 4th generation guys have! Here is a picture to give you an idea of what you'll need to do. The picture shows the three pieces hard tubing put in place of the pucks which used to be there. I have also received an email from a guy who said he used 5/16" rubber automotive fuel line. So, as you can see, this doesn't have to be a "precise thing"... just something that will fit in there and provide a means to "connect" the two pieces!